Bramble Berry carries two different types of olive oil: Pure and Pomace. Pure olive oil is from the first pressing of the olives, and in soaping recipes, it allows you lots of time to work with a recipe. Pomace on the other hand, is made by extracting the last bits of oil and fat from the paste left over from pressing the Extra Virgin Olive Oil. 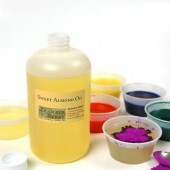 It tends to trace much more quickly than pure olive oil, so it’s best for simple recipes. 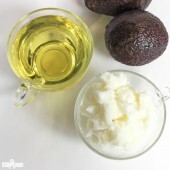 Unless noted, all recipes on the Soap Queen blog use Pure Olive Oil. Since olive oil is pressed from real olives, the color of the oil can vary due to crop variations and where the oil is from. If you buy olive oil several times from the same source and you notice slight differences in color or smell, don’t worry! Olive oil is a common ingredient in cooking and it’s widely available on grocery store shelves. Be careful though! 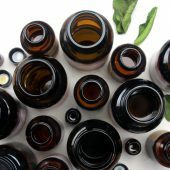 When a variety of oils were put to the test (see All Olive Oils are not Created Equal) many of them failed. Rancidity was a common issue, so be sure that your source sells through and rotates their stock regularly. 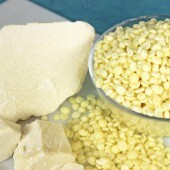 Traditionally, Castile soap is made with 100% Olive Oil. 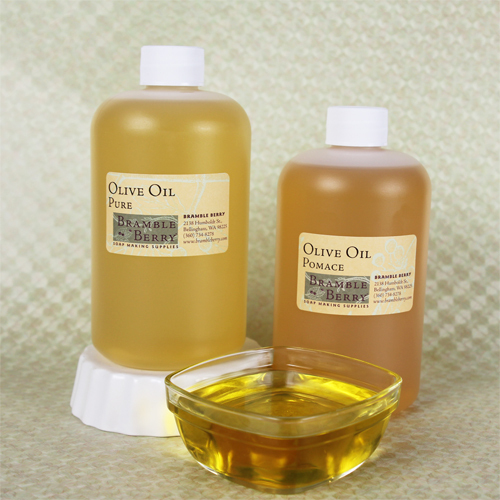 However many Castile soaps have other oils in them, but Olive Oil is always a main ingredient. It’s somewhat controversial over how much olive oil needs to be in the soap to be called ‘castile’ but typically this amount is 80% or higher. Castile soap gets its name from the region in Spain where it was first created, and it’s one of the oldest soaps known to mankind. In fact, mentions of Castile soap have appeared in books as early as 1567 (though regular soap beats that by just a few years with its first mention in 1700BC)! 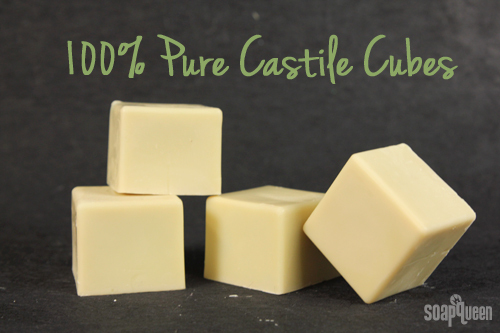 Castile soap is known for being gentle and soothing. 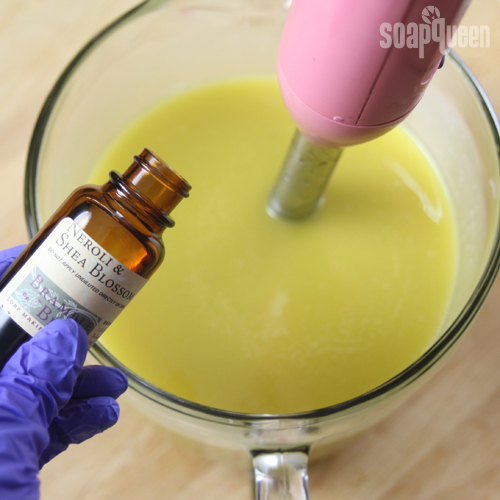 This Buttermilk Bastille Bar recipe by Amanda of Lovin’ Soap is a great recipe for sensitive skin that predominantly uses Olive Oil. 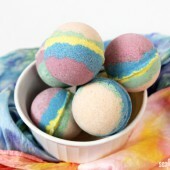 Because it only contains one oil, Castile soap is a great recipe for beginner soapers. 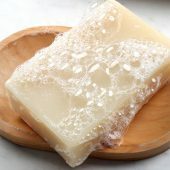 Keep in mind, Castile soap is starts off fairly sticky and soft and doesn’t have a rich lather. It can take weeks to harden up enough to unmold, and even longer to cut. If you do make Castile bars though, it’s worth the wait, up to a year for them to shine. 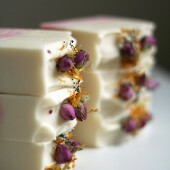 Yes, I have noticed that my castile bars lather better after a full year of curing time! 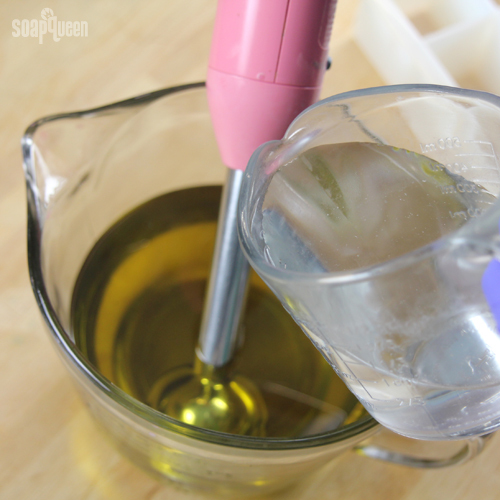 Try your hand at making Castile soap with this quick recipe. ONE: Slowly and carefully add the lye to the water and gently stir until the lye has fully dissolved and the liquid is clear. Adding Sodium Lactate to high olive oil content recipes helps to harden the soap so unmolding can happen more quickly (probably 30-50% faster). Add about 2 teaspoon of Sodium Lactate and stir. Set aside to cool. 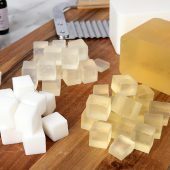 NOTE: This soap will stick in your molds for a ** couple weeks ** with or without sodium lactate (I am not joking; castile soap is *that* soft when soaping in silicone). TWO: Portion out the olive oil. Once the lye water has cooled to 130°F or below, add the it to the oil and stick blend until medium trace. Ooooh, look at that gorgeous green color from the pure olive oil; it’s so luxurious! THREE: Add 3 oz. 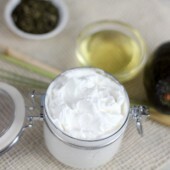 of Neroli and Shea Fragrance Oil. 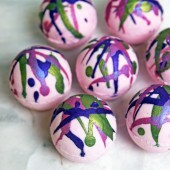 Since you aren’t doing any complicated designs or swirls, you can stick blend or whisk the fragrance in. 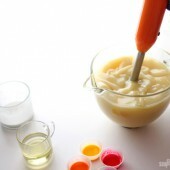 FOUR: Pour into the 9 Cube Silicone Soap Mold. Now play the waiting game! 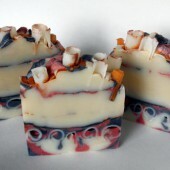 It most likely (most definitely) takes a full two weeks to unmold this soap. Allow it to cure and harden for at least another 4 weeks, and longer if possible. Enjoy – and set aside a bar to test out in a year. 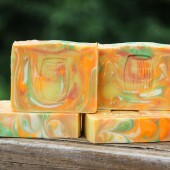 You’ll be surprised how much the lather has improved after a full year cure time with this unique type of soap. Stay tuned next for more Roman-themed tutorials. What have you made with Olive Oil recently? 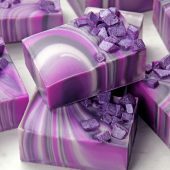 Do you have any tricks that you use to help it unmold more quickly for CP soap? I have a question. 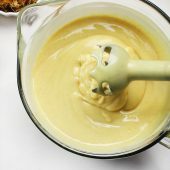 I followed this recipe exactly but I must of been mixing for about 2 hours and the mixture would not go past a light trace. I gave up and poured into my mold at this very light trace hoping it would still harden. It sat over night in the mold and I checked it this morning and it still not harden up – it is now like a pudding consistency. There is nothing wrong with my lye so I am not sure why this happened. I was using a mix-master, not a stick blender however I would’ve thought this wouldn’t of made this much of a problem. Any suggestions? Should I try baking it in the crock pot? Please help!! Thank you. We have updated our Lye Calculator since then, so it does look a bit different. However, it does work the same way! 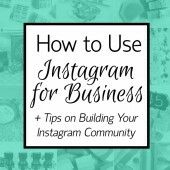 Thank you for posting this tutorial! I have one question. 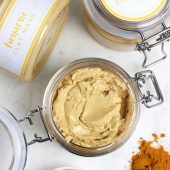 What percentage superfat was used for this recipe? I may have missed it, but I didn’t see it mentioned. I assume that increasing the superfat content would slow the curing? Just making the pure Castile. I want it fragrance free. Presumably I can just leave out the EOs? I don’t need to add more olive oil to make up the shortfall? Hi Kelsey.My name is Julie and i am from Grecce.I want to make liguid castille’s [olive soap]soap.I don’t know what to do.Can you help me please? Where can we find the video for liquid castille? 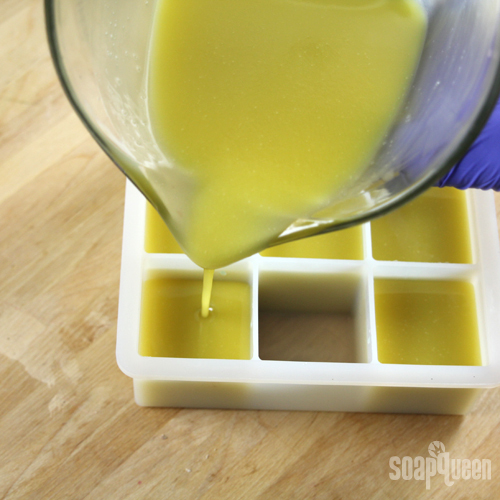 I’m still confused about which grade of olive oil is best for soap. 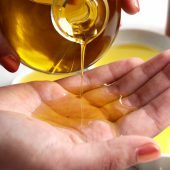 Some say that it makes no difference one way or another, but according to The Best Natural Homemade Soaps: 40 Recipes for Moisturizing Olive Oil-Based Soaps, by Mar Gomez, you should, “Use the highest quality extra virgin or virgin olive oil you can find to create the best soap” (29). I’d assume the highest quality is organic extra virgin olive oil. You use/recommend pure olive oil, which is a grade below virgin olive oil, and pomace “olive oil” which is the lowest grade. 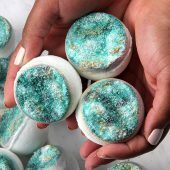 I know if you plan on consuming it, the higher the quality, the better–which also applies if you plan on using it directly on your skin/hair–but how much of a difference does it make for soap? 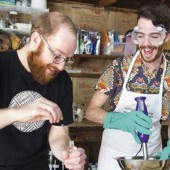 Should you use a higher grade if you’re making soap intended for the face? 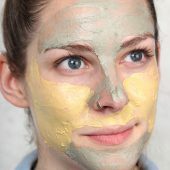 Or, more specifically, a soap intended as a moisturizing mask since that’ll give your skin more time to absorb the ingredients? But then use a lower grade for hand/body soap since you rinse that off shortly after? “…the higher-quality oils, like EVOO and virgin olive oil, contain more of the good-for-you healthy phenols (i.e., antioxidants). According to FitSugar, EVOO also has higher levels of vitamin E, vitamin A, chlorophyll and magnesium. So wouldn’t you want a better grade since they have higher levels of vitamin E/A, chlorophyll, magnesium, and healthy phenols? 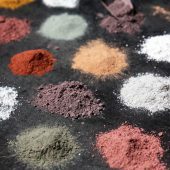 Or does the saponification process destroy most of these beneficial components making it a complete waste of money and therefore it’d be better to use a lower grade, like pure olive oil, as you do, for your soap making? 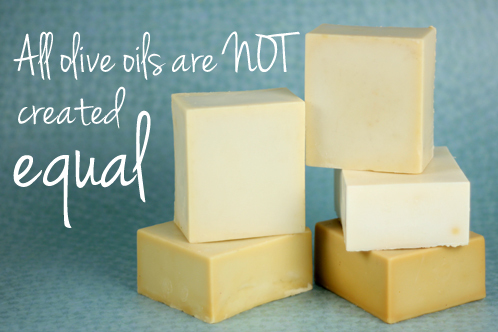 Just because fresh “high quality” olive oil (of any grade) doesn’t/shouldn’t develop DOS/creates a soap that feels very nice doesn’t mean that all grades create soap of equal quality. At least… That’s what I’m having trouble figuring out. If you can clear this up for me I would truly appreciate it. That’s a great question! 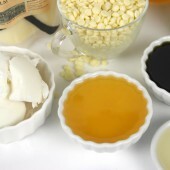 The saponification process is really hard on the ingredients you add to your recipe. 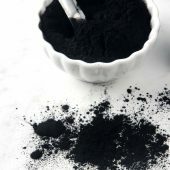 Because it changes pH several times throughout the process, it is tough to say if all the nutrients in the oil make it through that harsh environment. 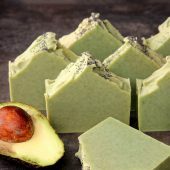 “Unlike in cooking where you always want to use the highest grade possible, you can use the lower grade olive oil for soap making without any problems! In fact, some people prefer the lower grades because of its quicker trace. Surprised? Well, to be honest with you, so was I. 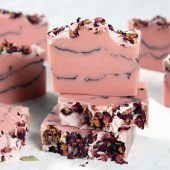 Believe it or not, in olive oil soap making, we can actually break the rule of always using the best ingredients without any negative consequences! 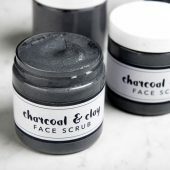 You see, here’s what you have to understand: ‘Grade B’ olive oil, as long as you use a completely natural and organic form of it, is only low quality for consumption not for cosmetics. 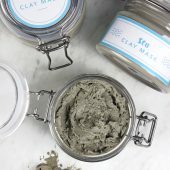 Could I use sodium lactate and a salt water brine? Both the sodium lactate an the salt would go into the lye water, I want to make sure there won’t be a reaction. 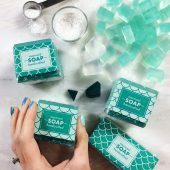 Hello, I love your website as a resource for learning to make soap! I was wondering if pure olive oil castile soap is the same as Marseille Soap (Savon de Marseille)? I’ve heard marvelous things about it, and that it’s a soap made of olive oil (made with sea water and maybe some other oils). Have you heard of it? 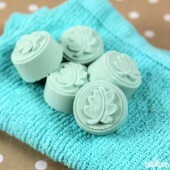 I have heard of Savon de Marseille soap! 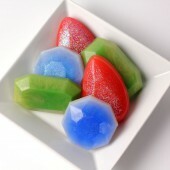 There are several different definitions of what makes a savon soap. From what I understand, Savon de Marseille soap is a soap made with at least 72% olive oil. 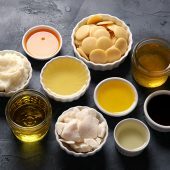 The rest of the oils can be coconut or palm. It is unscented. 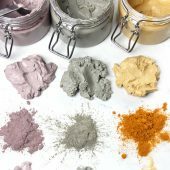 It is sometimes left uncolored, or has French green clay for color. First thanks for sharing a good infos. 10 days ago I made a Castile soap 100% extra virgin olive oil. The surprise was a soon as I pour the lye solution in the oil I get a medium traces in 30 second even without using a stick blender (only with a spoon). Temp of lye solution and oil was 120 and with 38% water . Kesley thanks for the reply. I used a total of 38% water . Im working in a vegetable oil refinery so i know well about the saponification reaction . I tried a pure olive oil with an acidity less than 1% at the same water ratio 38% and all looks fine . Im just wondering why extra virgin olive oil wont works well . The supplier of the olive oil was my uncle’s farm 🙂 it is cold mechanical pressed olive oil with no additives at all . But there is some good news here. Yesterday i made another batch of that recipe same ammount of everything but the only change was the temperature of lye and oil. Both were at 83F and the process was working smoothly . 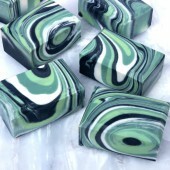 Im looking forward to give a try with aleppo soap since i get some laurel oil from there . I was wondering if I can hot process 100% olive oil soap and will it still need to cure for a year? I must have missed this comment, I am so sorry! 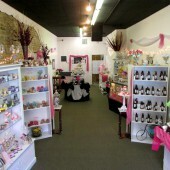 Hi There, Just read your response about Hot Processing Castille soaps. If Hot Process shortens curing from a 6 month wait to 1 week, why on earth would someone want to make Castille using Cold Process??! Ha ha. But seriously I’m curious. That’s a great question! It mostly boils down to personal preference. Can I use EVOO for castille? is this advisable? I have about 10 liters of Kirkland EVOO on hand now, and 5 liters of Pomace. Which one do you prefer for castille? 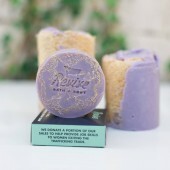 Im thinking it will be too soft a soap if I use EVOO. Hi I’m a newbie here. 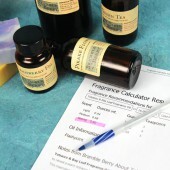 In this recipe fragrance oil was used.how do u calculate adding essential oil (aragon etc) into this recipe? Hello! 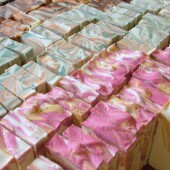 I have been making soap for about 3 years now and have always made 100% olive oil cold process. 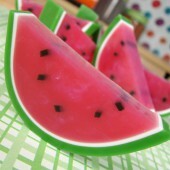 It does take a long time before I can unmold, and even longer to slice, but I find that it’s worth it! 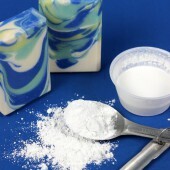 I have been planning some more complicated swirls, and am looking into sodium lactate to firm my bars up quicker. I don’t want to smudge my designs because my bar is still too soft in the middle. And that is how I stumbled upon this post. Would you recommend a water discount as well? I use your lye calculator. I’m here quite often, and always love the information I leave with. Thanks Brambleberry! You can definitely water discount if you like! Water discounting at 10% or so and adding 1 tsp. of sodium lactate per pound of oils to your cooled lye water will help your bars firm up a lot faster. 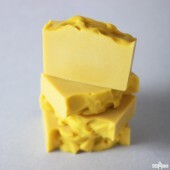 Then, after the soap has sat long enough to firm up, you can cut those bars. If you notice they’re still pretty soft and wanting to smudge your swirls, let it sit another couple of days before cutting again. That way there aren’t any pesky drag marks. I would like to use herbal infusion = tea together with the 100% olive oil . can i freeze the tea before ading the lye to it in order to keep the benefits of the herbs. isn’t it too cold for the olive oil encountered with the lye solution? You can freeze the tea if you like! Then, add the lye slowly and stir well. That will help the tea stay cool through the entire process. Also, because olive oil is liquid at room temperature, it will mix in just fine with the cold tea! How long do you find this usually takes to trace? 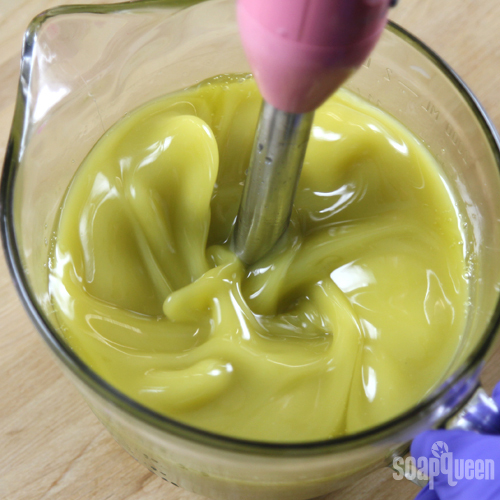 My olive heavy recipes can take 10 minutes or more to trace so I soaped this at room temperature thinking I’d have loads of time to color and do a nice funnel pour. I used rose absolute to scent it, because what better time to use an accelerating scent than in a super slow recipe, right? It went from barely tracing to pudding in about 5 minutes. 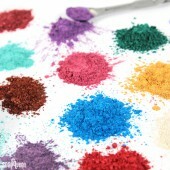 By the time I finished incorporating the color into one half, the other half was already setting up in the bowl! I’m assuming the rose was the culprit (I salvaged the design by doing an in the mold swirl instead) but I was curious how long this normally takes when not using temperamental additives? 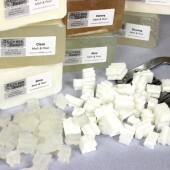 Thanks so much for sharing this soap making processes. 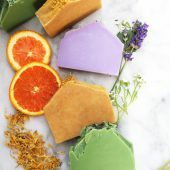 I am starting my own blog pretty soon too (castilesoap.bar) dedicated to bring organic and castile soap information and recipes. 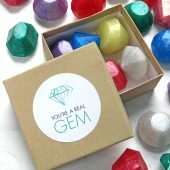 Your blog is a great resource and holds excellent content. Thanks for putting the time. Thank you so much for your kind words! Also, thanks for sharing that link. I can’t wait to check it out. 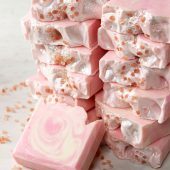 Can I use goat’s milk in place of water in any CP soap? You can definitely use goat milk in place of water. Goat milk is a little trickier to work with than water. If it gets too hot it can scald, which can make the soap discolor or smell unpleasant. To keep this from happening, you can freeze your goat milk beforehand. 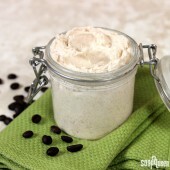 Then, add your lye slowly – about a spoonful at a time. It helps to have your lye and goat milk mixture in an ice bath during this process. 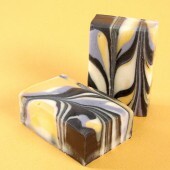 If I wanted to make a cp soap that was 75 or 80% olive oil what other oils would you add to make a better lather and less slimy bar? Castor? Coconut? Avocado? Palm? 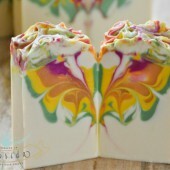 Coconut and Palm Oils help make a harder bar of soap, so they would be a nice addition. 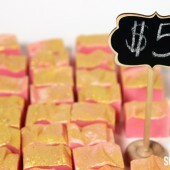 Also, Castor Oil is great for making bubbly soap! 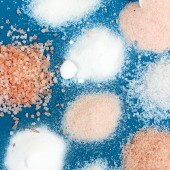 Can I use salty water instead of sodium lactate? If i have a liquid sodium Lactate that says in the label 60% solution, how much should I use? 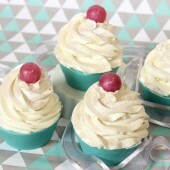 We didn’t test this recipe using salt water, but I believe it would be OK! You may want to make a small test batch to see if it works. As for the other sodium lactate, I’m not sure! 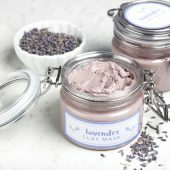 We only use Bramble Berry products so I can’t say how much to add! 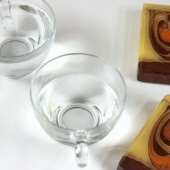 A few days ago I made a Castile soap 90% olive oil 10%castor oil, I did a water discount. I was as to unmold in about 3 days. I use water discount too) but it takes extra care to deal with lye solution, because it becomes more dangerous. 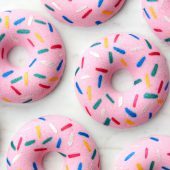 I found out that soaping with higher temperatures also helps. 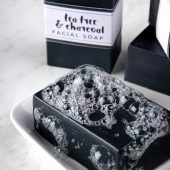 I am not sure about exact temperature, I have no termometer for my soap and lye, but the containers feel really warm. 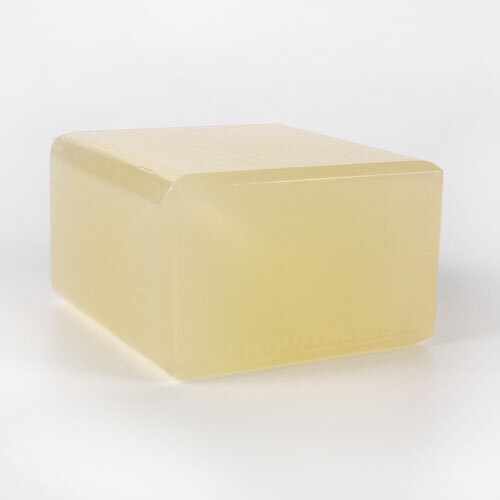 The soap gets to trace faster, there is more chance to get it through gel (putting it in warm place also helps), the unmolding is faster and easier and this soap is pretty good after only 2 – 2,5 months. I’ve used huge water discount (about 18%-20% of water). Result was very hard bar! It was easy to unmold right the next day. That’s awesome, thanks so much for sharing your expertise!